MILWAUKEE -- It's one of the more interesting plants you'll see at the Mitchell Park Domes. However, it's not its visual appearance that peaks interests. "I thought it would stink and I wanted to smell it," Arjun Patel said. "It smells like expired milk." 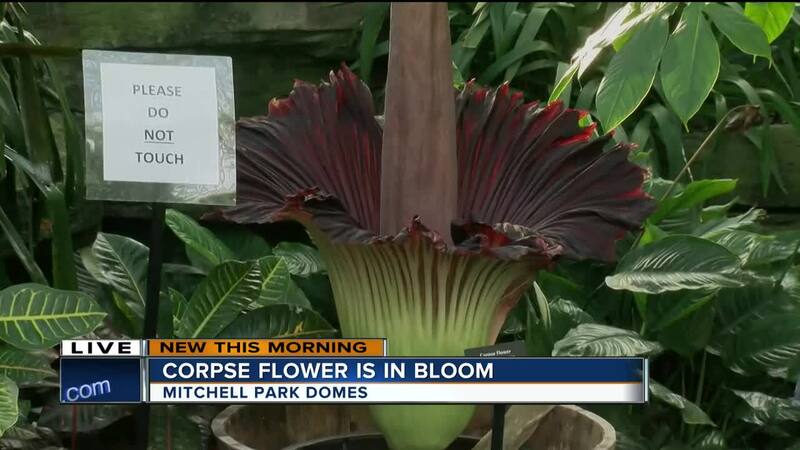 Not exactly a ringing endorsement but that's exactly what you get with the Corpse Flower blooming at the Domes. "It's like if you went camping and left some meat in your cooler and forgot about it," Mary Braunreiter, Horticulturist at the Mitchell Park Horticultural Conservatory said. "Then, opened it up a few days later." Braunreiter says this is a very rare occurrence for folks in Milwaukee to see. The plant is native to only tropical climates and only blooms once every seven to ten years. Then, once it blooms, it only lasts about 24 to 48 hours. So it's a small window. "Today is really the only day we can guarantee to see it," Braunreiter said. "Tomorrow, it might already be wilting." People took heed to the warning. Just before the park opened at 9:00 a.m., there were already more than a dozen people waiting to get inside. It is a very strange reaction to get the chance to smell something gross. "Middle school locker room would be a good description," Zechariah Bethke of Greendale said. Other children said it smelled like feces or flatulence; the kindest way to repeat what they said. The smell grabs the headlines, but some were more interested in the beauty of what the flower means. "I have a lot of interest in the natural world," Brian Sobczak of Milwaukee said. "It's one of the very exciting parts of being alive, seeing the other things being alive." But that trademark scent has a purpose. It looks like rotting meat and smells like rotting meat for a reason. "Most pretty flowers that smell good attract bees and butterflies but this gets pollinated by carrion flies," Braunreiter said. 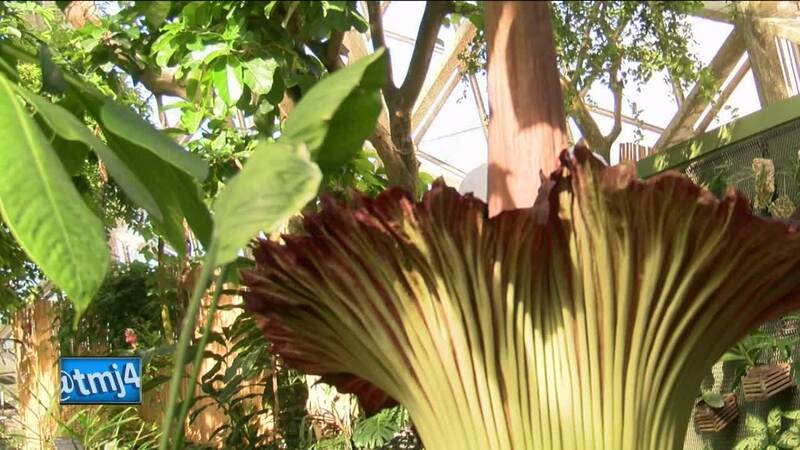 "It has to be stinky to attract them because that's what lives in Sumatra where it grows naturally. It has to have them as pollinators. That's why it has to smell bad."